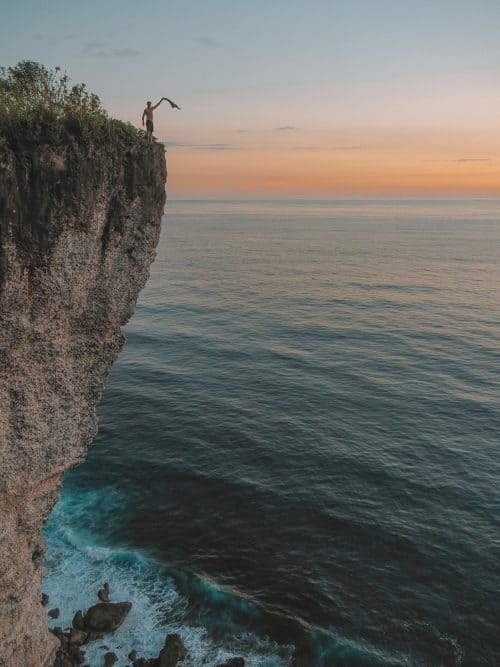 The Karang Boma Cliff is one of the best sunset viewpoints on the island of Bali, Indonesia. 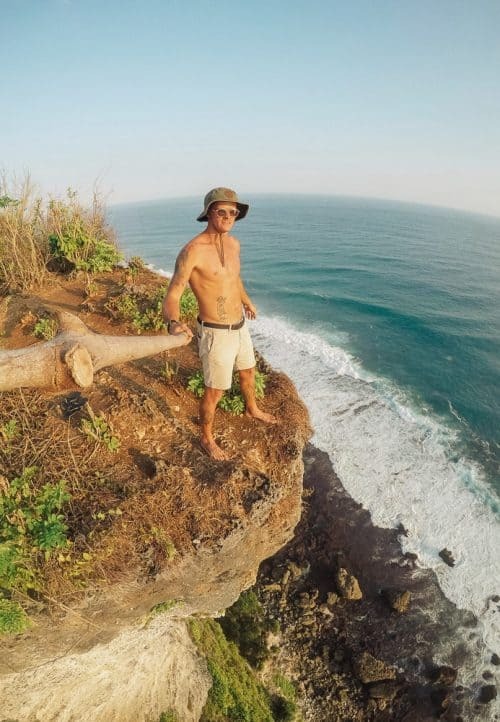 I have visited this particular viewpoint in Uluwatu on countless occasions to explore the unique cliffs that soar high above the waves below. The Karang Boma Cliffs are like none other that I have ever seen! 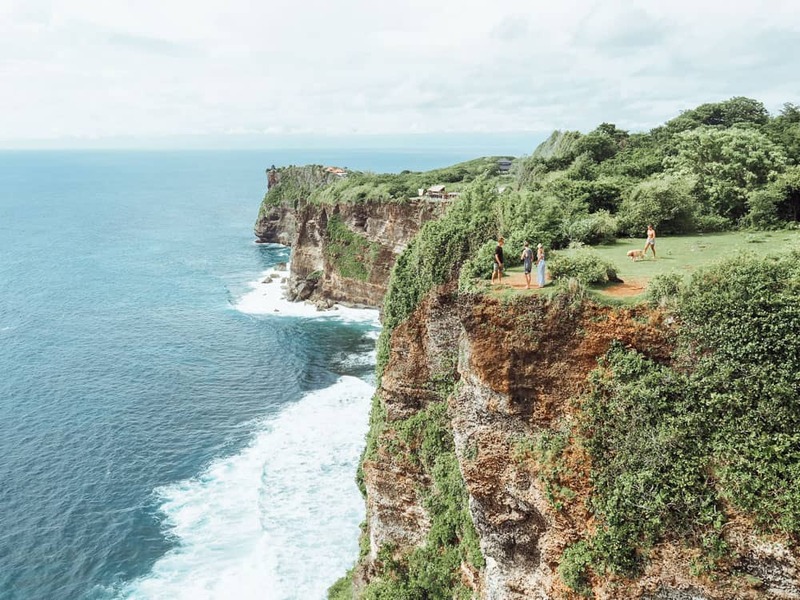 The Karang Boma Cliff viewpoint is located in the Uluwatu region on the Bukit Peninsula. From the main hub of Kuta and Seminyak, it is approximately a one hour drive to Uluwatu and the cliffside viewpoint. If you are staying down in Uluwatu, the Karang Boma Cliff is only 5 minutes drive from the popular Uluwatu Temple. 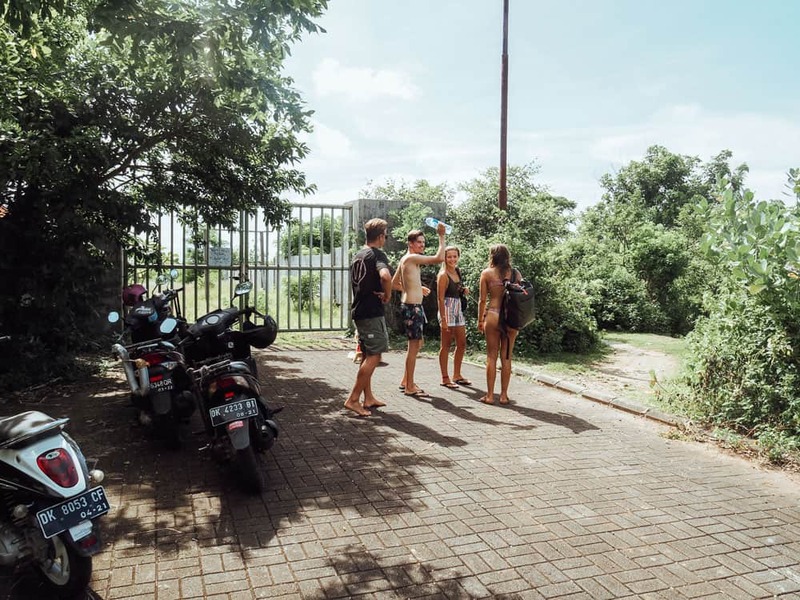 When using Google Maps to find the Karang Boma Cliff, it will lead you to the end of a paved road and to a small car park out the front of a locked gate. At first, I thought I was going to have to climb this gate to make my way down to the cliffs though, I found a dirt trail on the right-hand side of the gate that lead us all the way down to Karang Boma Cliff. See the images below that shows the turnoff and signpost for Karang Boma Cliff and the other is of the carpark at the big gates. Look out for these landmarks and you shouldn’t get lost. There is an entrance fee of 10,000 rupiah to visit Karang Boma Cliff due to its recent popularity. As my friends and I made our way down closer to the cliff edge, we were in complete awe of the landscape that surrounded us. 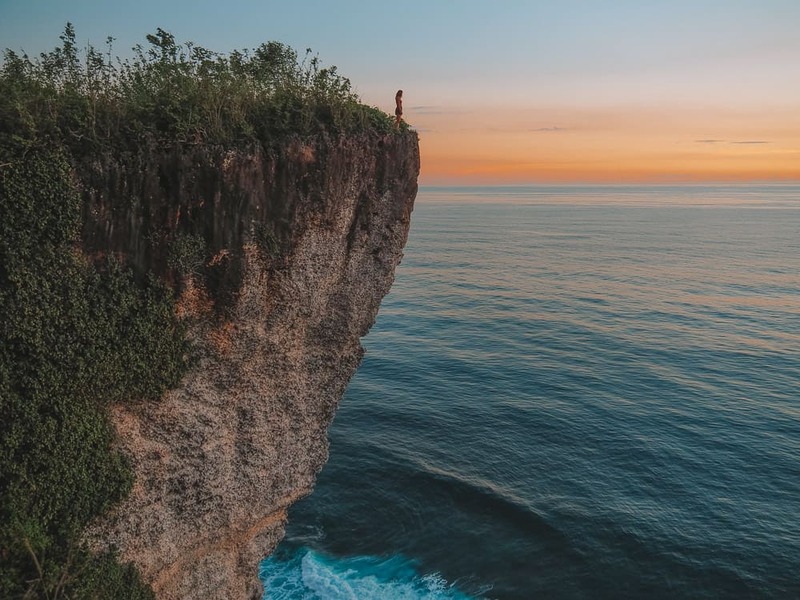 The rocky cliffs tower high above a stunning reef break below and Uluwatu Temple can be spotted on the peak of a nearby cliff in the distance. 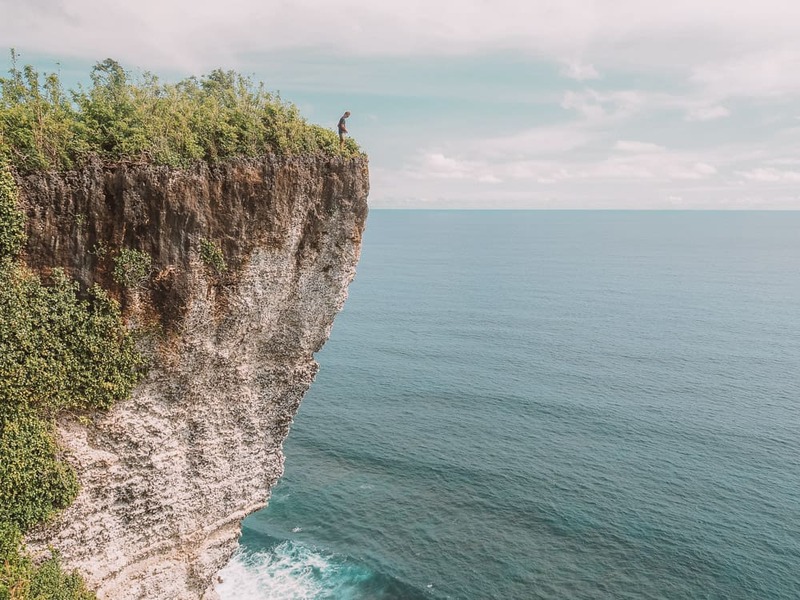 It is possible to walk out on to the very edge of Karang Boma Cliff but do so at your own risk. It is approximately a 100-meter drop to the shoreline. It is a truly exhilarating experience when standing on the edge of this phenomenal cliff face. The best time to visit Karang Boma Cliff is at 5pm – 6pm for the golden hour of sunset. However, due to the recent popularity of this particular viewpoint, you may have to wait in line to get a good shot of the cliff face at this time. It is also a great place to explore during the middle of the day and there will most likely be no one else around. Occasionally you may be able to spot some keen surfers riding the waves below. As I mentioned earlier in this article, please take care and explore these cliffs carefully and at your own risk. There are no fall restraints in place to stop you from falling if you happen to accidentally slip. I hope you enjoyed reading this article and if you have any questions about Karang Boma Cliff please drop me a comment below. Havent been here since in Bali. Would definitely check this out!